I am excited to show you Oscar’s newest trick. Oscar recently learned how to shake! This was a really fun trick to teach him, and he loves showing it off to family and friends. Here is the video Oscar and I put together on how to train a mini pig to shake. If you’re less interested in the instruction and just want to see him shake, start around minute two. I initially tried teaching Oscar to shake in combination with sit, asking him to sit first and then shake. When we did that, he couldn’t balance well enough to raise his hoof, so that method didn’t work for us. Once I took sit out of it and just had him shake while standing, he figured the trick out quickly. If you’re having trouble teaching your mini pig to shake and have been asking her to sit first, try just letting your mini pig stand in place and shake. For us, that made the training much easier. As with most mini pig training, teaching Oscar how to shake was a gradual process taught in smaller steps. I started by simply touching Oscar’s hoof while it was on the floor and saying “shake.” Then I gently picked up his hoof, lifting it higher each time while saying “shake.” Eventually, I was able to stop lifting his hoof and he learned to raise it up to meet my hand. You don’t have to wait until your mini pig gets the trick exactly right to give a click and a treat, as long as she is making steps in the right direction. Remember to keep the training short and fun; stop and try again tomorrow if you or your mini pig gets frustrated. If you’re just starting out with training your mini pig, I recommend starting with circle since it’s a quick and easy trick for your mini pig to learn. Once your mini pig has circle down and knows what to expect during training time, it will be easier for your pig to learn how to sit or shake. As always, if you’re having trouble teaching your mini pig to shake, don’t hesitate to let me know by asking your question in the comments section. We ran into a few challenges with trying to get mini pig Oscar to wear a harness. Our first challenge was finding the best kind of harness for him and the next was getting Oscar to let us put the harness on him. Here is a video discussing the two types of harnesses we have tried on Oscar and how to put a harness on a mini pig (peacefully!). We have gone back and forth between a step-in harness and an over-the-head harness for Oscar. 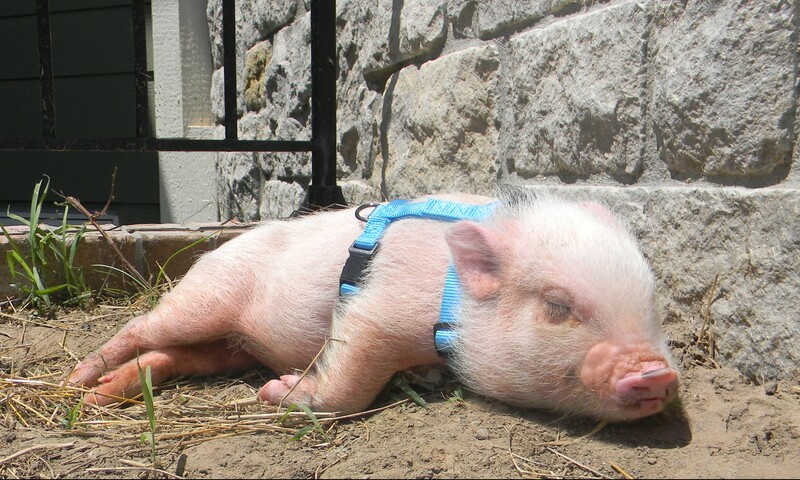 Step-in harnesses are generally recommended for mini pigs, but we had trouble getting that type on Oscar. We couldn’t get him to stand still long enough to get his short little legs into the harness and, when we did, he managed to still slip out a few times. Once Oscar gets a bit older and calmer, we plan on trying this kind again, but it’s not our preferred harness type for him while he’s young and wiggly. We use an over-the-head harness on Oscar, and it works well overall. Initially, he squealed and fought us when we put the harness loop over his head. He actually hated the harness so much that he would whip his head around and act like he was going to bite us. We decided to try positive reinforcement with the harness training and gave him treats for letting us put it on him, and his attitude about the harness changed immediately. The over-the-head harness we have works for now, but it’s not a perfect solution. I have read about harnesses made especially for mini pigs, and I will try one of those when Oscar stops growing out of things so quickly. If you have a mini pig harness that works well or any additional tips on how to put a harness on a mini pig, please tell us about it in the comments! Oscar learned to sit! It took a few weeks of consistent training and patience, but he can finally sit. Watch this video to see how I taught Oscar to sit. Teaching a mini pig to sit was much more difficult than teaching him to go in a circle, but I’m glad we stuck with it. Sitting is a foundation for so many other tricks, such as stay, shake, and wave, so I wanted to make sure Oscar could sit before we moved on to new tricks. Sitting doesn’t come naturally to Oscar like it does for my dogs, so for several training sessions he just didn’t understand what I was asking him to do. What worked was using a floor with good traction and a wall to back Oscar up until he was naturally forced to sit. Once he correctly sat a few times, I was able to reinforce the behavior with the clicker and then he knew what I wanted. Getting him to sit the first few times was the hardest, and he learned quickly once he knew what to do. If you are just starting out with training your mini pig, here is more information on how to hold your mini pig and on training basics and teaching your mini pig to go in a circle. Pigs are smart, and intelligence is such a great quality to have in a pet. Pigs potty train easily and learn tricks quickly, and I believe their intelligence helps in forming a strong, lasting bond. A smart animal, however, can present challenges. Oscar constantly keeps me on my toes because, frankly, he’s quicker to outsmart me than our dogs. This means I have to work to stay a step ahead of him. Also, unlike dogs, pigs don’t go out of their way to please humans or work for affection, so that means coming up with creative ways to make sure Oscar is well trained and behaved. I realized recently that I constantly negotiate with Oscar. I don’t negotiate with my dogs because I expect them to listen and do what I’ve asked. However, my little mini pig is stubborn and has no problem ignoring me and doing whatever he wants. That doesn’t mean he’s a bad pet; it means I’ve had to learn his language and adjust my tactics. As you might expect, a mini pig’s language is food. Oscar generally does what he pleases, but he would sell his soul for a Cheerio. So, I use this to my advantage when teaching him the behaviors that work for our home. I was initially hesitant to use food as an incentive for our pig, but it’s usually the only way to get his attention. I try to use healthier treats and really small pieces throughout the day to limit his overall consumption, and that works because he isn’t picky about what or how much he gets. One of the times I negotiate with Oscar is when I need him to come inside the house after a potty break. When Oscar goes outside, he loves to eat grass but then throws a fit when he has to come in. Instead of just dragging him in, I either let him get a mouthful of grass “to go” or I pick a few pieces of grass and give them to him on the way in. That has worked well and has reduced his reluctance to come in. Another time I negotiate with Oscar is when I put his harness on and take it off. He used to hate everything about his harness; it was a stressful battle each time ending with a crabby pig and frustrated mom. I started giving him half of a Cheerio each time I put his harness on and took it off, and he immediately became accepting of the harness. We use the same method to get him into his crate at night, and now he’s eager to run in and go to bed. Since Oscar is still young, we are constantly coming up with new negotiations. The best thing about the negotiations is that the positive behavior (such as the harness) “sticks” even after we remove the treat; this allows us to use the food rewards for other behaviors and helps me feel comfortable that the negotiations are effective in training him long term. Negotiating with a pig feels strange sometimes, but it has allowed me to enjoy his intelligence without getting frustrated by the challenges that come with it.